As a mom of three who loves reading and who sells children’s books, there are a lot of books that come my way on a daily basis for review or comments. Some are not in relation to my blog or my children, and some, quite frankly just don’t fit the bill. I take book reviews seriously when it comes to dishing out money for a book for your children’s education or for your 2-3 minutes of time alone in between taking care of your family and the day to day mama chores. Let’s face it; if you have the time to read something (anything! ), you want it to be inspiring, refreshing, thought-provoking, helpful….it’s a tall order! Well, my fellow mamas, I have had the pleasure of reviewing a book that does just that. 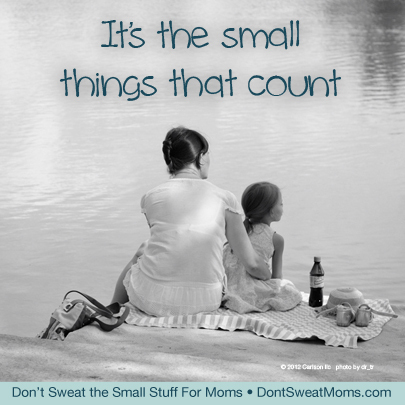 I am thrilled to tell you all about the newest book in the Don’t Sweat series called Don’t Sweat the Small Stuff for Moms. I was chosen for this social media campaign and I couldn`t be more touched! 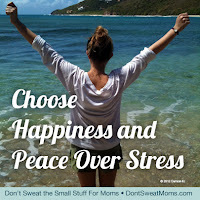 This campaign is creating a community of moms that are coming together to stress less and choose happiness more. It’s about finding our joy in everyday parenting. If you have been reading my blog, you know I`m all about listening to my children and rolling with the punches. If they`re having a hard day, our schedule changes, simple as that. I try very hard to adapt around their moods in order to decrease stress for them and also for me. Adding more happiness to our life just naturally occurs when we are all listening to each other. It’s not fool proof, but most of the time, it really helps! I can truthfully tell you that Don’t Sweat the Small Stuff for Moms is a must-have for mamas, and a perfect gift for a new mama. My best friend gave me a personal gift when my first child was born. It was so special! I think all new mamas should get something for themselves after the birth of a baby. THIS is the perfect something. The book is categorized with 100 chapters, all pertaining to different aspects of motherhood. There is truly something for every type of mama at every different stage. Some chapters are about being a new mama; others are about having children all grown up. But every chapter is filled with compassion for you as a mother. 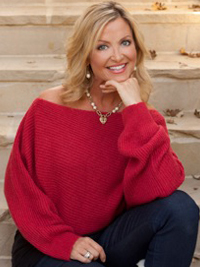 As I read the book, I feel like I am chatting with author, Kristine Carlson, over a coffee and getting hugs throughout! There is so much thought put into every chapter, and nothing is left un-discussed. I am savoring this book. I am so grateful to have been chosen for this campaign and I take this book wherever I go. The chapters are short enough to fit in between little moments in my day and give me an instant boost. And some suggestions that Carlson makes about taking better care of myself have already been put into place and are making a difference in my energy as well as my outlook. A lot of Carlson’s suggestions go back to the basics. She reminds us that it is important to carve out family time with meals together, reading books aloud together (yay! ), and creating your our traditions, for example. Most of us probably know these already. But reading it in this context with loving thoughts of living a better, less stressful life, encourages us to make it possible! Ask the question: why do we do this anyway? These are the chapters that are resonating with me right now, but there are so many other wonderful chapters. To get your free copy of the first chapter, click here. Do yourself a favour and pick up a copy for the summer. You won’t be disappointed. And if you have a friend that has just become a mama, this book will be one of the best presents she could receive! I sweat the small stuff all of the time. I could really use this book for some pointers on being able to relax. LOL! I nap everyday (well almost). That’s basically my only “me” time. LOL! Follow you on Twitter (@insanemamacita). As a busy mama of 4 (6 & under) I know this book would be a great tool for me to use daily! I read one of her first books… it was awesome! Thanks for sharing! That book would for sure give me some new ideas for my daily live with my three kids! My little one is napping while the two orders are playing together in their room for one hour – I love this hour for myself! I follow Don’t Sweat moms on Twitter (@zoojourneys). I follow you on Twitter (@zoojourneys). I follow Don’t Sweat Moms on Pinterest (Journeysof TheZoo). I follow you on Pinterest (Journeysof TheZoo).